Aqua (Solvent/Diluent), Butyrospermum Parkii (Skin-Conditioning Agent/Emollient), Glycerin (Humectant), Theobroma Cacao Seed Butter (Emollient), Isododecane (Solvent), Neopentyl Glycol Diheptanoate (Skin Conditioning Agent - Emollient), Glyceryl Stearate (Emulsifier), Cetearyl Alcohol (Emulsifier), PEG-100 Stearate (Surfactant), Cera Alba (Emulsifier/Emollient), Dimethicone (Skin Conditioning Agent), Glycine Soja Oil (Emollient/Skin Conditioner), Orbignya Oleifera Seed Oil (Emollient), Bertholletia Excelsa Seed Oil (Emollient), Prunus Amygdalus Dulcis Oil (Skin-Conditioning Agent), Phenoxyethanol (Preservative), Parfum (Fragrance), Dipentaerythrityl Hexahydroxystearate/Hexastearate/Hexarosinate (Skin Conditioning Agent), Xanthan Gum (Viscosity Modifier), Phenethyl Alcohol (Fragrance Ingredient), Caprylyl Glycol (Skin Conditioning Agent), Benzyl Benzoate (Solvent), Vanilla Planifolia Extract (Natural Additive), Benzyl Alcohol (Preservative), Disodium EDTA (Chelating Agent), Tocopherol (Antioxidant), Coumarin (Fragrance Ingredient), Hydroxycitronellal (Fragrance Ingredient), Benzyl Salicylate (Fragrance Ingredient), Limonene (Fragrance Ingredient), Linalool (Fragrance Ingredient), Sodium Hydroxide (pH Adjuster), Hexyl Cinnamal (Fragrance Ingredient), Benzyl Cinnamate (Fragrance Ingredient), Citral (Fragrance Ingredient), Citric Acid (pH Adjuster), Farnesol (Fragrance Ingredient), Geraniol (Fragrance Ingredient), Amyl Cinnamal (Fragrance Ingredient), Isoeugenol (Fragrance Ingredient), Eugenol (Fragrance Ingredient), Anisyl Alcohol (Fragrance Ingredient). [+/- Caramel (Colour), CI 19140 (Colour), CI 15985 (Colour)]. There are two for one in this little pot. A wonderfully creamy moisturiser and a thicker cream that almost crumbles when you rub it in. I love this duel pot from Body Shop. The creamy whipped side, I use as a normal body moisturiser and the thicker butter side I use for my elbows, knees and ankles. This is my favourite Body Shop product and I cannot recommend it enough. The Body Shop is known for it's body butters and they are my favourites, but out of their entire range of body butters this is definitely my favourite. I love vanilla in general and the scent of this is lovely, I wish they had more products with this scent. As for the the butter itself, when you open the pot unlike most of the body butters it is split in to two sections, ones with a light creamy like texture and the other is a very thick almost solid looking butter. I get very dry and itchy legs and love using the thicker cream on them, but for areas like my arms I use the lighter one which you can spread out thinly rather than trying to mess around with the thicker one when you don't need it. It's much better than having to use two different products with different scents and I really enjoy using this. The moisture it provides is incredibly long lasting as well, I can usually feel it on my skin 24 hours later and it just leaves my skin feeling incredible. A little pricey, but The Body Shop almost always have offers either specifically on these or general money off when you spend a certain amount, so it's rare that you'd actually be paying the full price. I personally find Body Shop creams expensive at full RRP. 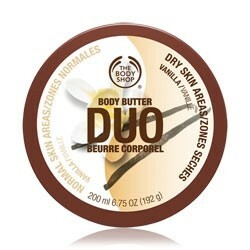 I think this is an odd product as why put two creams in one pot - just use a bit less of the thicker one.It smells quite nice and creamy and does feel nice on my skin but I got mine on half price and there is no way Ii would pay full RRP for it. Great texture (I mostly use the Body Shop coconut butter) and a saviour for really dry skin. Very long lasting. Can be a bit expensive unless you can get it when it's on offer. I've used a few body moisturisers but this is the best one by far and the smell is like being in paradise!